The Problem Glyphs art book contains 100 glyphs and their associated submissions, accompanied by an introduction by Eliza Gauger and a foreword by award-winning writer, Warren Ellis. Problem Glyphs is a premium edition, display-worthy art book, measuring 10x12" and featuring a Smyth sewn, genuine clothbound hard cover with gold foil-stamped cover illustrations, and an integral black ribbon bookmark. The 210 interior pages are printed on beautiful matte coated art paper. Tremendous care has gone into every aspect of the book, from its binding to its typography, the beautiful and storied Doves Type. Problem Glyphs is available now. Problem Glyphs has been the subject of artist Eliza Gauger's attention since autumn 2013. She has crafted over two hundred sigils in response to the deepest, darkest problems submitted anonymously online by thousands of individuals. 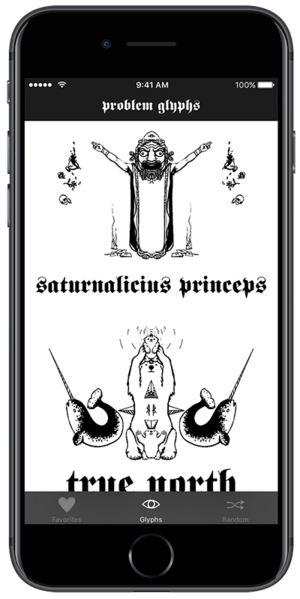 Drawing upon her background in fine art, mythology, and the occult, Gauger responds to these problems by creating intricate, symbol-laden glyphs that are published online with an accompanying descriptive title, free of charge. A special, limited edition of Problem Glyphs is now available. Featuring a genuine leatherbound cover with gilt page edges, this deluxe edition is limited to 100 copies, each signed and numbered by Eliza Gauger. Problem Glyphs is now supported by an app for iOS devices. Search for glyphs by name, tag, or content. Favorites, to keep track of all the glyphs you need to return to. Random: an easy way to pull just the right glyph out of the aether. Glyph Details, to read the full text, date, and tags of the original glyph posting. Sharing, to send glyphs to yourself on other platforms, to friends, or to easily post them outside the app.